Saturday 31 May 2014 was the date for a Tramps Ball held by Victoria Unity Masonic Lodge No 296, Banbridge in the Province of Down. 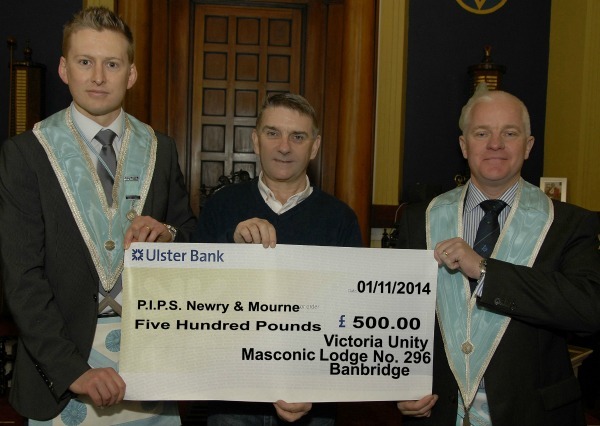 The chosen charity for Victoria Unity Masonic Lodge was PIPS Newry and Mourne, PIPS meaning Public Initiative for the Prevention of Suicide and Self Harm. A princely sum of £500.00 was raised by the Lodge members, friends and family while having a great time. The function hall was well dressed for the occasion with all the required extra's (a lot of cleaning up next day, lol) and everyone turned out in great and some really funny and imaginative outfits, well done to them, particularly the winner of the fancy dress competition who gained a much needed prize which was a, wait for it...........roll of toilet roll, he he. A vast array of music to suit all ages and likes was brilliantly supplied for us by Mike Bambrick. The food which was plentiful, tasty and hot was supplied by Jimmy's on the Scarva Road, Banbridge (girls didn't know what had hit them, lol) but basic as for the occasion, great choice. And our raffle and auction items was donated by lodge members and fellow brethren. The Worshipful Master would like to thank everyone that attended, donated or in anyway helped to raise such a fantastic amount on the evening.